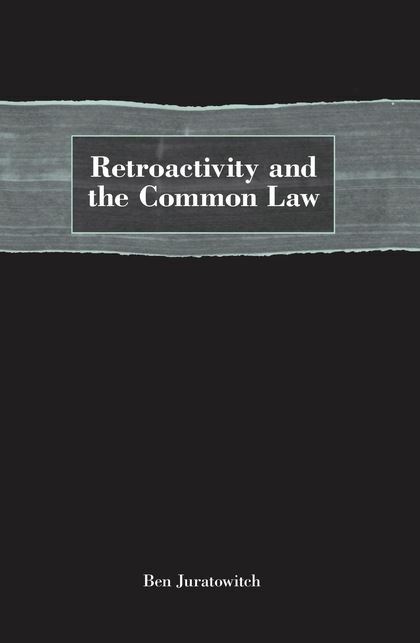 This book analyses the common law's approach to retroactivity. The central claim is that when a court considers whether to develop or change a common law rule the retroactive effect of doing so should explicitly be considered and, informed by the common law's approach to statutory construction, presumptively be resisted. As a platform for this claim a definition of 'retroactivity' is established and a review of the history of retroactivity in the common law is provided. 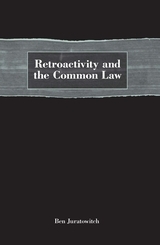 It is then argued that certainty, particularly in the form of an ability to rely on the law, and a conception of negative liberty, constitute rationales for a general presumption against retroactivity at a level of abstraction applicable both to the construction of statutes and to developing or changing common law rules. The presumption against retroactivity in the construction of statutes is analysed, and one conclusion reached is that the presumption is a principle of the common law independent of legislative intent. Across private, public and criminal law, the retroactive effect of judicial decisions that develop or change common law rules is then considered in detail. 'Prospective overruling' is examined as a potential means to control the retroactive effect of some judicial decisions, but it is argued that prospective overruling should be regarded as constitutionally impermissible. The book is primarily concerned with English and Australian law, although cases from other common law jurisdictions, particularly Canada and New Zealand, are also discussed. The conclusion is that in statutory construction and the adjudication of common law rules there should be a consistently strong presumption against retroactivity, motivated by the common law's concern for certainty and liberty, and defeasible only to strong reasons. satisfactory decision-making in the future. ...The author not only discusses the recent cases but examines the question in the light of authority in other Commonwealth jurisdictions and with due regard to the more theoretical literature. This is a valuable contribution to what is an important current debate in the law. E A Presumption of Variable Strength? (a) Was Retroactivity in Issue? 1 What is Adjudicative Retroactivity? A What is Prospective Overruling?